So forgive me for this edition of ROH Recap as seeming “half-hearted” considering that my DVR failed me and began taping this week’s edition of ROH TV halfway through the show. I hope that you tuned in (or your DVR didn’t fail you) and you caught the show. 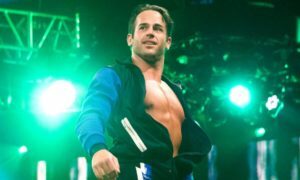 This week was highlighted by a main event featuring arguably the two best wrestlers in the company in current ROH champ “The American Wolf” Davey Richards and “The Messiah of the back-breaker” Roderick Strong. Now let’s get on to my thoughts from this week. Unfortunately I missed the spotlight on a certain ROH superstar as well as any recap as well as the first match of the show. So we’ll just jump straight ahead to this week’s main event. For some wrestling purists anything less than a 5 star instant classic would seem as a disappointment. The match started out with the combatants standing toe to toe and showcasing their world class striking skills. Striking the likes of which can’t be found anywhere in the world of professional wrestling. 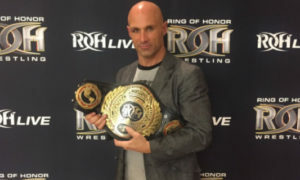 Kevin Kelly made the comparison of Richards striking to that seen in the MMA world along with letting us know that Richards has his own MMA like camps that he conducts before a match with his Team Richards that consists of current ROH wrestlers Kyle O’Reilly and Tony Kozina. One highlight right off the bat was the sick bump that Richards took courtesy of a Roderick Strong side suplex on the ring apron!!!! The action then spilled to the outside area where these two continued to take turns exchanging stiff chops and kicks. The action outside the ring also featured a picture perfect suicide dive by Richards. Once action resumed inside the ring Richards and Strong again traded forearms and Strong was turned inside out by a Richards lariat. There were many false finishes as Richards made multiple attempts at his ankle lock finisher and countered Strong’s 2nd gutbuster with a crucifix for another near fall. Richards nailed his alarm clock maneuver for yet another near fall. Never one to be left out of the equation the head of the House Of Truth, Truth Martini made his presence felt and distracted referee Todd Sinclair and that lead to Strong decapitating Richards with his sick kick but the resilient champion managed to kick out before the three count. After what seemed like the fourth of fifth ankle lock Richards was able to pull Strong to the middle of the ring, grapevine the legs and force the tap out to retain the title in his first defense of the ROH world title on ROH TV. Now my overall thoughts for this week. Immediately the argument begins among ROH wrestling purists as to weather this match holds up to matches that these two have had in the past as well as if it was worthy of being an ROH main event or even if it was as good as last weeks main event between El Generico and Jay Lethal. I did enjoy this match and thought it was extremely physical. I’m such a fan of these two wrestlers and their work rate that I could watch them play checkers and know that just their competitive nature and dislike for one another alone would make it far more interesting than anything seen on WWE or TNA television!!!! I did miss the features this week as well as the in-ring interview to start the show that seems to be a staple with Jim Cornette. I now look forward to a double main event next week. One of the matches is rumored to be The Briscoes VS. The All Night Express. In the words of Jets Safety Bart Scott… “CAN’T WAIT”.